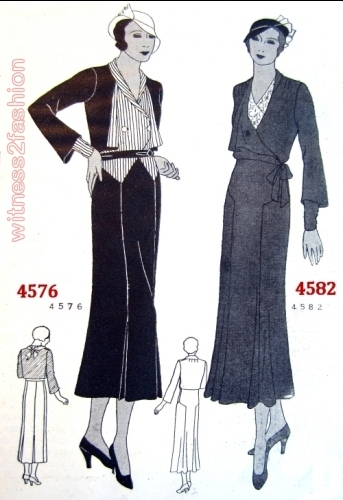 Famous designers are alluded to, but the designs are not actually attributed to them:“Vionnet was the first to drape necklines.” (# 4572) “Lanvin and Mainbocher used cape sleeves.” (# 4584) “It was Lanvin who started this fashion of stripes combined with plain color,” (# 4576) and “Schiaparelli pink” is suggested for the jabot of # 4542. “A famous name sponsors the three-quarter sleeves and wide revers” of # 4593. 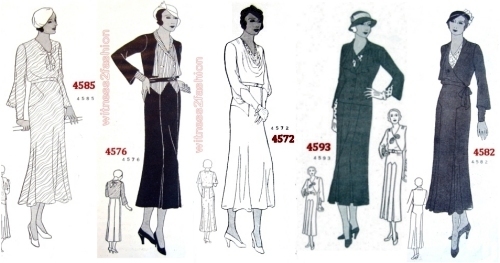 Although the illustrations all show a tall, slender model, five of these designs are for large women, and they are not singled out. All 8 designs were available in size 44 [i.e., for a 44 inch bust measurement], but # 4585 and # 4576 ran to size 48″, and three, # 4572, # 4593, and # 4582 are specifically recommended as slenderizing, reducing the hipline, etc. 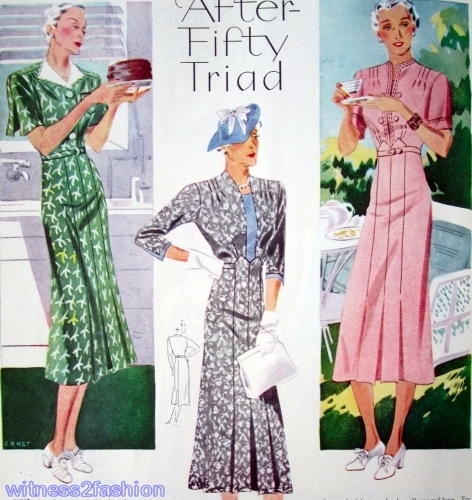 Those three patterns were sized for women up to a 52 inch bust. 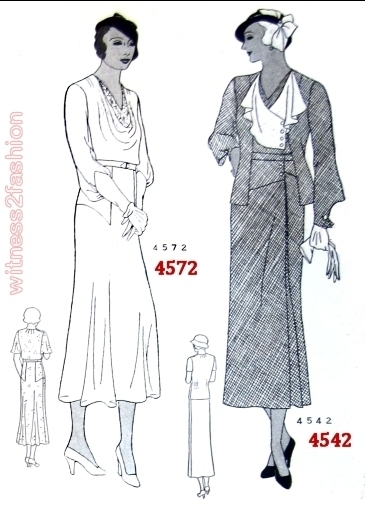 One pattern, #4585, is “Specially becoming to short women,” although no adjustments in length are mentioned. The smallest dresses are for a 30″ bust. # 4602 “Sheer jacket frock”: The new full-at-the bottom sleeves are, nevertheless, tight at the wrist, and graceful as you can see. As for the dress, its sleeves are capes. [See back view] The fabric – the big fabric for summer jacket dresses, is semi-sheer crêpe – plain or printed. This dress is designed for sizes 12 to 20; 30 to 44. # 4585 “high tied”: There are simpler ways of reducing your hipline than dieting and exercising. 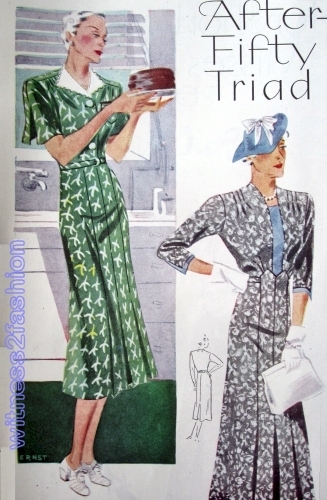 One of them is the clever hip yoke of this frock. 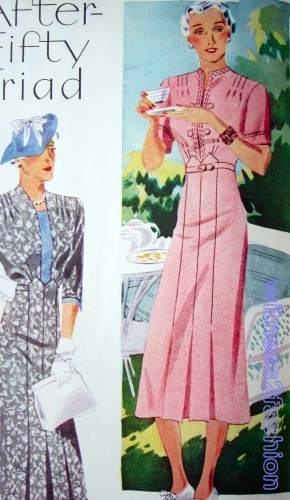 Its sleeves follow the mode in a manner of their own. Specially becoming to short women. Designed for 34 to 48. 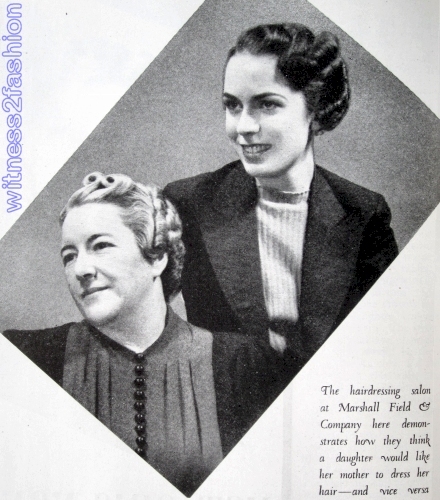 # 4572 “because it’s becoming”: Vionnet was the first to drape necklines. We favor this one because it is becoming to everybody. 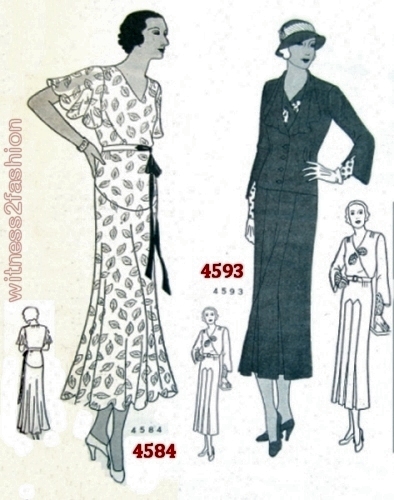 Two more reasons why this dress is a find for the larger woman are – the sleeves, full enough to be smart but not enlarging, and the yoke, cut to reduce the hips. 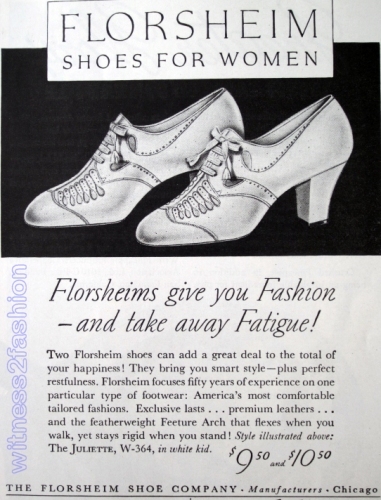 Designed for 36 to 52. # 4542 “with Schiaparelli pink”: Pink is the new accessory color– a nice soft easy-on-the-complexion pink…. for the jabots if the rest of the costume is of navy blue, which it is almost sure to be this season. This is one of the… jacket dresses that Paris has sent….Designed for 32 to 44. #4584, sizes 30 to 44″; #4593, sizes 36 to 52″. # 4584 “shoulder capes”: Lanvin and Mainbocher used cape sleeves and so did almost every other dress-maker. 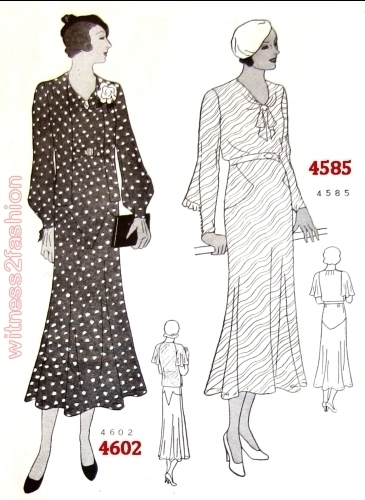 Of course nothing could be more perfect for this cool, summery frock of chiffon. It’s young looking but any age can wear it. Designed for sizes 12 to 20; 30 to 44. # 4593 “the jacket urge”: Here’s something to satisfy that jacket dress urge. 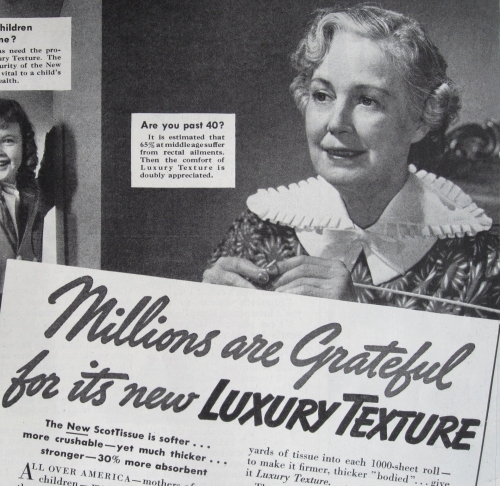 A famous name sponsors the three-quarter sleeves and wide revers. It’s slightly shorter than last year’s jacket and it has this year’s new fitted look. 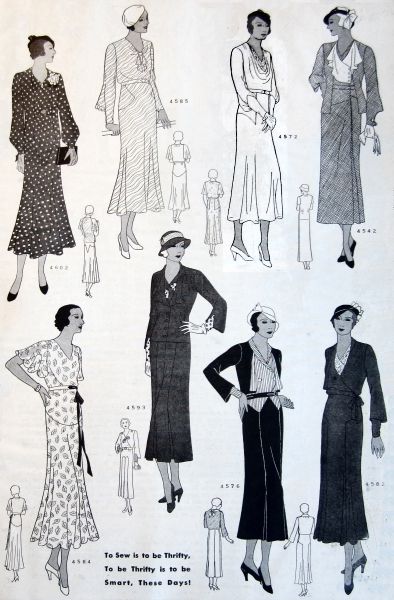 The frock specializes in slenderizing lines. 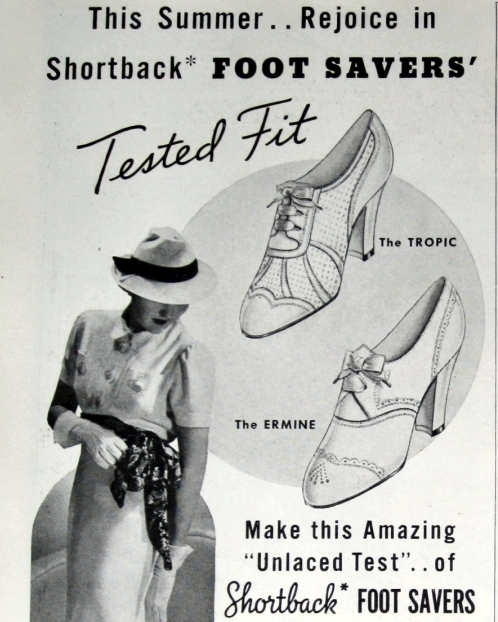 It is designed for sizes 36 to 52. # 4576 “Lanvin stripes”: It was Lanvin who started this fashion of stripes combined with plain color. And the smart place for them is in blouses. 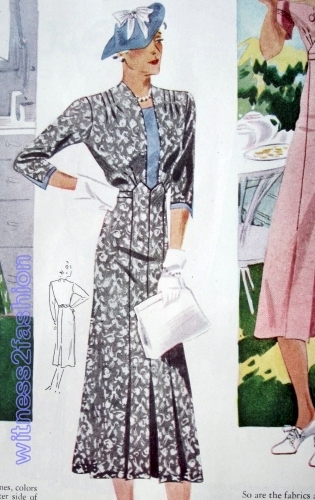 It’s “blouse” in name only here, however, for this is a dress with a jacket – easier on the figure than the costume of skirt, blouse and jacket. Designed for 34 to 48. # 4582 “lace for the face”: The unsymmetrical dress is the one that does the most for the larger figure. In the first place, it’s interesting, in the second, it’s reducing. We added the lace at the neckline for face flattery. The most slenderizing fabric for this is chalky semi-sheer crêpe. Designed for 36 to 52.